I get this flag goes up when someone talks about properties but leaves out numbers. “How much?” “Is it enough to matter?” “How big compared to counter forces?”. It’s very easy to speak of a true technical property, but have it gnat’s knees compared to a Boeing 757… and not notice. So I figured I’d make a bit of noise about it and see if anything started to jell. The data showed that, in comparison to today, the Atlantic Ocean surface circulation was much weaker during the Little Ice Age, a cool period thought to be triggered by volcanic activity that lasted from 1450-1850. Since these set of ocean currents are known to influence global climate, the researchers were interested to see if it correlated with rainfall in the Western Hemisphere, and how such a correlation could change over time. Researchers at The University of Texas at Austin have found that a well-known period of abrupt climate change 12,000 years ago occurred rapidly in northern latitudes but much more gradually in equatorial regions, a discovery that could prove important for understanding and responding to future climate change. The research, published Sept. 2 in Nature Communications, focuses on the Younger Dryas, a cooling period that started when the North Atlantic Current, an ocean current, stopped circulating. The event caused Earth’s northern hemisphere to enter into a deep chill, with temperatures in Greenland dropping by approximately 18 degrees Fahrenheit in less than a decade. “We found that the temperature in Greenland is like a small ship that you can stop and turn quickly because of the influence of sea ice in the region, while rainfall in the tropics is like a big ship that takes a long time to course correct,” said Jud Partin, a research associate at the University of Texas Institute for Geophysics (UTIG) who led the study. 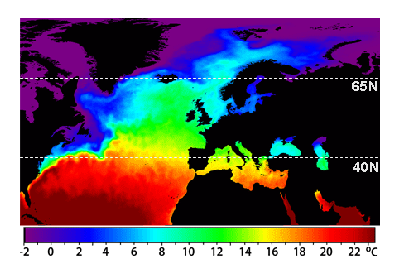 So again we have a cold spell with slowed / halted Gulf Stream and north Atlantic current. Does the cold stop the circulation or does the circulation stop cause the cold? In either case, how can it be that “melting glaciers” causes a halt when the glaciers are growing like crazy in the Younger Dryas? What I find particularly interesting about this one is that it shows that even Florida is anti-phase to Greenland. Mostly it is based on water, rather than directly on cold, but that’s fine. It finds that during the glacial (when Florida was about twice as wide as it is today), the way rains were controlled by warm / cold was about the same. When it is cold, not much rain. When it’s warm, lots of rain. Now that happens between winter and summer, then it shows up as a climate shift. So every Heinrich Event shows up as cold in Europe, but wet in Florida (so the pine trees grow and the pine pollen spikes up) as Florida gets wetter and warmer. When it’s warm in Europe, Florida is more cool, so dry, and you get oaks. There’s a lot more in the article. Grasses and some other plants too. GISP Ice cores. The key takeaways for me were simple. That 1500 year cycle keeps on happening. Though sometimes with a partial skip (weak cycle). It is water mediated with the Gulf Stream taking a break for a while and both Arctic and Antarctic deep water formation being involved. Something outside natural ocean oscillations drives it as it stays on the same periodicity despite a variety of ocean changes and ice changes and even strength of event changes. The metronome doesn’t shift much (though the effects sometimes skip a beat). Now if it is warm melting glaciers causing the Gulf Stream / North Atlantic Drift to slow or halt, how can that be happening when Europe is getting more frozen and the heat is backing up in Florida and the Gulf of Mexico? How can it happen on a regular 1500 year cycle without outside drivers? To me, it looks far more like solar inputs to the ocean drive the overturning (compare the MW of solar heat in the global tropical and temperate oceans vs the pittance of MW-thermal in a glacial outflow) and those thermal driving changes reflect in the speed of the current. 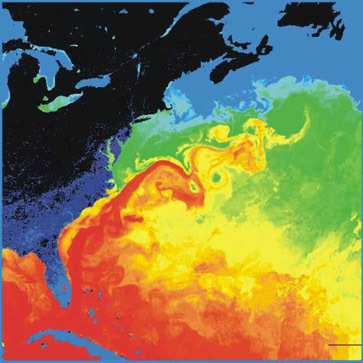 How big is the Gulf Stream? Are glacier flows at all near it in size? Where is the 100 km wide river of glacial meltwater into the North Atlantic? Where is the kilometer deep river flowing into the north Atlantic? 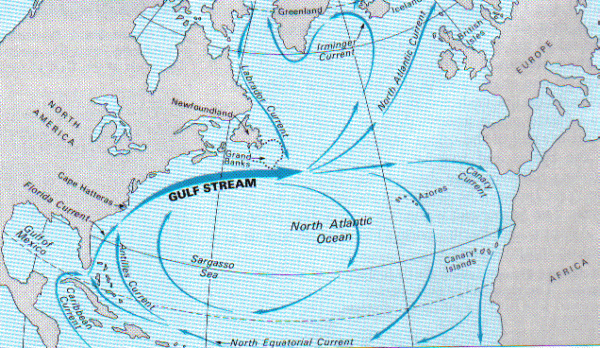 As a consequence, the resulting Gulf Stream is a strong ocean current. It transports water at a rate of 30 million cubic meters per second (30 sverdrups) through the Florida Straits. As it passes south of Newfoundland, this rate increases to 150 million cubic metres per second. The volume of the Gulf Stream dwarfs all rivers that empty into the Atlantic combined, which barely total 0.6 million cubic metres per second. So there’s a range of about 1/8 to 2/3 of the simple cross section math result. The entire Amazon River is less than 1/1000 that size. None of them is big enough to be found even in the rounding errors of Gulf Stream Flow and variation. So just how much can “Glacial Melt” stand up to variation of Gulf Stream flow? Can that flea on the mouse’s tail really steer and halt the elephant? IMHO this little “rough estimate” sanity check shows the whole “Glacial melt slowing ocean currents” to be a canard of the worst kind. Yes, it needs much more detailed numbers to be run. Yes, it is only a ballpark sanity check. But also yes, when you have a control input that’s at least 1/10,000 the size of the thing it is reputed to control, AND the physical history has the results opposite to that reputed control, your control input is not a control input. I would assert that far far more important are variation of solar input to the tropical oceans (in particular where the solar energy is deposited – on the surface as IR and reds, or deep as UV and blues) and variations in the global winds and tides (likely heavily influenced by the lunar tidal changes of ocean depths and tides). How else can you get a regular 1500 year cycle but by external drivers? Variations in solar irradiance are widely believed to explain climatic change on 20,000- to 100,000-year time-scales in accordance with the Milankovitch theory of the ice ages, but there is no conclusive evidence that variable irradiance can be the cause of abrupt fluctuations in climate on time-scales as short as 1,000 years. We propose that such abrupt millennial changes, seen in ice and sedimentary core records, were produced in part by well characterized, almost periodic variations in the strength of the global oceanic tide-raising forces caused by resonances in the periodic motions of the earth and moon. A well defined 1,800-year tidal cycle is associated with gradually shifting lunar declination from one episode of maximum tidal forcing on the centennial time-scale to the next. An amplitude modulation of this cycle occurs with an average period of about 5,000 years, associated with gradually shifting separation-intervals between perihelion and syzygy at maxima of the 1,800-year cycle. We propose that strong tidal forcing causes cooling at the sea surface by increasing vertical mixing in the oceans. On the millennial time-scale, this tidal hypothesis is supported by findings, from sedimentary records of ice-rafting debris, that ocean waters cooled close to the times predicted for strong tidal forcing. How then can you claim a minuscule VARIATION in a trivial amount of fresh water is doing anything significant at all? As it travels north, the warm water transported by the Gulf Stream undergoes evaporative cooling. The cooling is wind-driven: Wind moving over the water causes evaporation, cooling the water and increasing its salinity and density. When sea ice forms, salts are left out of the ice, a process known as brine exclusion. These two processes produce water that is denser and colder (or, more precisely, water that is still liquid at a lower temperature). In the North Atlantic Ocean, the water becomes so dense that it begins to sink down through less salty and less dense water. (The convective action is not unlike that of a lava lamp.) This downdraft of cold, dense water becomes a part of the North Atlantic Deep Water, a southgoing stream. Now what are the odds that salinity increases in wind driven flows of 1000 times to 10,000 times larger ocean current can overwhelm salinity decreases from glacial melt? This entry was posted in AGW Science and Background, Earth Sciences and tagged Current, Glaciers, Gulf Stream, Ocean. Bookmark the permalink. Most of the discussion about the Ocean streams has been dismissive instead of investigative. Pretty much like the contradictions of too warm and too cold causing the streams to stop (there is a stream off the pacific coast as well). I blame the fact that they cannot directly relate – or do not want to relate – a cause and effect to AGW. So they pencil whip it out of their models. Just mention “Arctic and Glacier Melt” in your report and mega $$$$ coming in. Salt water freezes and the salt christals are sqeezed out out of the ice creating the so called brine that should make the ocean water a bit saltier untill the ice melts again.. The ocean is one big mixer. No worries. As for the glaciers, they come and go during the interglacial and completely occupy huge land masses during an ice ages, completely reshaping the landscapes.. Who gives a sh**t about a little salt. Sea water however exposed to strong radiowaves is able to produce a 1500 degree Celsius hot flame, burning of the hydrogen. If the amount of electric power you put into this process is providing a benefit? I don’t think so. The guy who did the trick has died in the mean time but just the idea that the combined broadcasting power of MSM transmitters could heat my home with salt water makes my day. Fluidic switches can switch fluid flow using very small inputs. They were doing research on them in the 1960’s to investigate the possiblity of a non-electronic computer that would be invulnerable to EMP. The input of a small pulse from the control ports on the side can switch which wall of the flow channel the fluid attaches to. So for example a puff of flow out of the St Lawrence Seaway into the Atlantic could detach flow from the west coast of the Atlantic near Greenland and make the gulf stream turn across the Atlantic in a tight loop that intersects Europe much lower than currently where it keeps England relatively warm. It could accomplish this by causing the north atlantic current with the Canary current so it makes a more southern short loop. This would cut of warming to northern europe and result in a catastrophic shift in climate that only took years to occure. phys,org did not do justice to the Austin study of the gulf stream variability. Research conducted at The University of Texas at Austin has found that changes in ocean currents in the Atlantic Ocean influence rainfall in the Western Hemisphere, and that these two systems have been linked for thousands of years. The findings, published on Jan. 26 in Nature Communications, are important because the detailed look into Earth’s past climate and the factors that influenced it could help scientists understand how these same factors may influence our climate today and in the future. Note that the analysis shows centennial and decadal scale shifts in climate due to gulf stream fluxes. RE: the Little Ice Age, a cool period thought to be triggered by volcanic activity that lasted from 1450-1850. Comment: note 1450 estimated start date. maximum of oceanic tides occurred about 1433.
can explain this period as follows. NB it’s more precise than Keeling & Whorf. Way back when, an ice dam finally broke up North and dumped a HUGE amount of fresh water very quickly onto the Gulf Stream, IIRC around the terminus of it. That slowed it down, but as you say, the amount from melting ice is minuscule. The Gulf Stream has been said to influence the climate of Europe. The warmth of the water makes it just past Nova Scotia but not past the Island of Newfoundland. If one looks at the winds today (1/29/2018) with the nullschool dot net site there is darn little wind reaching the UK and Great European Plain that comes from the warm surface waters of the Gulf Stream. There is a large volume of warm saline water from the Mediterranean Sea that enters the Atlantic Ocean over the Gilbraltar Sill. The outflow is below the inflow of ocean water. Further, the outflow should turn to the north (right) because of the Coriolis effect, and there is a mid-ocean rift mountain out there. What does that water do? Recently, however, evidence has emerged that the Younger Dryas began long before the breach that allowed freshwater to flood the North Atlantic. What is more, the temperature changes induced by a shutdown in the conveyor are too small to explain what went on during the Younger Dryas. Some climatologists appeal to a large expansion in sea ice to explain the severe winter cooling. I agree that something of this sort probably happened, but it’s not at all clear to me how stopping the Atlantic conveyor could cause a sufficient redistribution of heat to bring on this vast a change. In any event, the still-tentative connections investigators have made between thermohaline circulation and abrupt climate change during glacial times have combined with the popular perception that it is the Gulf Stream that keeps European climate mild to create a doomsday scenario: Global warming might shut down the Gulf Stream, which could “plunge western Europe into a mini ice age,” making winters “as harsh as those in Newfoundland,” or so claims, for example, a recent article in New Scientist. This general idea been rehashed in hundreds of sensational news stories. It seems this particular myth has grown to such a massive size that it exerts a great deal of pull on the minds of otherwise discerning people. This is not just an academic issue. The play that the doomsday scenario has gotten in the media—even from seemingly reputable outlets such as the British Broadcasting Corporation—could be dismissed as attention grabbing sensationalism. But at root, it is the ignorance of how regional climates are determined that allows this misinformation to gain such traction. Maury should not be faulted; he could hardly have known better. The blame lies with modern-day climate scientists who either continue to promulgate the Gulf Stream–climate myth or who decline to clarify the relative roles of atmosphere and ocean in determining European climate. This abdication of responsibility leaves decades of folk wisdom unchallenged, still dominating the front pages, airwaves and Internet, ensuring that a well-worn piece of climatological nonsense will be passed down to yet another generation. Very informative piece, thank you and our Chiefo for his usual high class stuff. Surely you do not mean the biased British Broadcasting fake news Corporation? The warm peaks that mark the Younger Dryas represent solar ramp ups from ice age mode to interglacial. The first ramp up failed. Both peaks coincide with massive melt of the NA Ice cap, both responsible for massive floods and massive sweet water insertion in the Pacific causing a massive sea level rises. We also lost the Clovis people and the Mega Fauna. There is evidence found of a massive event with meteorites entering the atmosphere over NA, SA and Western Europe but no consenses on the subject yet. The extinction of the Mega Fauna reminds me of a video about the dinosaurs where the question was asked if these animals would be able to live on our planet today. That is a very interesting question and the answer of the experts is no. With the current G-forces a 180 ton Megasaur with a 12 meter long neck would not survive. 8 ton Elephants and Giraffes border at the limits of what is possible today. The conclusion of the researchers was that Gravity must have been significant less than our current 1G “constant” we’re used to. Mighty interesting stuff. As I see it, we have a lot of research to do to retrieve what exactly happend 12.800 years ago. That would be money well spend on real climate change. I read part of the “cosmictusk” material. I’ve no trouble believing there were impacts on the ice sheet. However, I do know a little about the Carolina Bays, and much more of the floods into eastern Washington State. Those involved both Glacial Lake Missoula and Glacial Lake Penticton. Neither of these things require a comet(s). The simpler explanations** by geologists and related earth-scientists do very well. For the floods, many people over many years have provided field studies. These data have been used to simulate (in 3-D graphic motion) one of the major floods from Lake Missoula. If the authors can re-write their Younger Dryas comet hypothesis without so much emphasis on the Carolina Bays and the Missoula Floods it would be more approachable for me. On the cosmic aspects and the physical-chemistry, my knowledge is very meager. Response to article about 3 trillion tons of Antarctic land ice ”lost” over 25 years. The Antarctic land ice volume is estimated at 26.5 E6 km^3, 26.5 E15 m^3, 2.65 E16 m^3. 3 trillion tons, 3.0 E12, lost over 25 years is 1.2 E11 per year or 0.00045%/y of the total mass. Now the article didn’t say whether English or metric tons and conflated sea ice and land ice as though there were no difference and just Google Antarctic land ice and find page after page of NOAA et. al articles that Antarctic land ice has grown. That’s what happens when food editors and sociologists and assorted snowflakes write science articles. Ocean pH has “acidified” from 8.2 pH alkalinity to 8.1 pH alkalinity. 9 pH is E-9, 1 ppb H+ ions. 8 pH is 10 E-9 or 10 ppb H+ ions. 8.2 to 8.1 pH is a change of a little over 1.0 ppb. Hard to believe that spells instant death for the oceans. Real numbers tend to dispel the hysteria – or not – depending on the power of faith. As my modest experiment demonstrates, the contiguous participating molecules of the atmosphere make such BB emission impossible. No GHG energy loop = No RGHE = Carbon dioxide and mankind play no role in the behavior of the climate. Remember, science neither cares nor chooses sides nor recognizes consensus.